Make sure employees have the apps they need on their devices, email on the first day, and the access they require to the network. Monitor their installed apps, even remove the ones you want, and keep everyone productive. 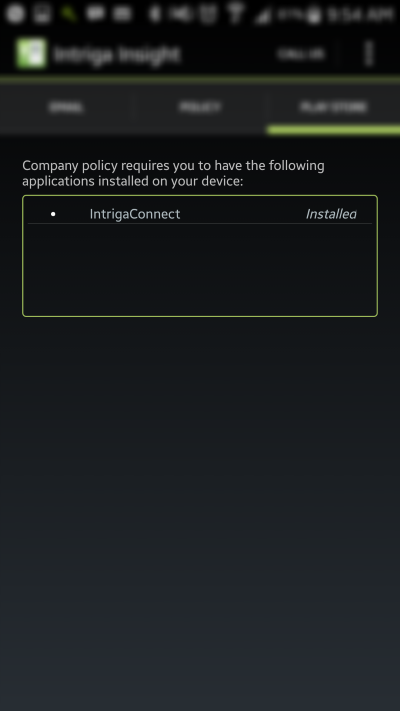 Give access to emails, contacts, and corporate networks by pushing the configuration to the device. Protect yourself from vulnerability and abuse by selectively removing your corporate assets whenever you want. Be alerted when employees install applications they shouldn't, prevent them from downloading apps on the Play Store and push the apps they require for work. Get your apps under control. Sign up in 60 seconds. Try it out, upgrade, downgrade, cancel at any time. No credit card required.